The groundbreaking study by lead author Elseline Hoekzema and colleagues at the Autonomous University of Barcelona and Leiden University was published in the journal Nature Neuroscience. They used Magnetic Resonance Imaging (MRI) to measure the key changes that take place in the female brain as a result of pregnancy. They found that the grey matter consistently shrinks in brain areas commonly associated with social cognition and the greater the degree of volume reduction in these areas, the deeper the mother-child bond. The brain areas in question included in the Superior Temporal Sulcus (STS) and Inferior Frontal Gyrus (IFG) on the outward-facing surface of the left and right hemisphere, and the Precuneus and medial Prefrontal Cortex (mPFC) of the inward-facing surface where left and right hemispheres meet in the middle. Far from reflecting a withering away of brain areas under assault from the tsunami of hormones that regulate gestation (mothers are exposed to progesterone levels over ten times greater than the highest levels of the normal menstrual cycle and more oestrogen during pregnancy than the rest of their lives put together) the changes actually reflect adaptations specialising the brain for maternal attachment. Volume reductions were also observed in the hippocampus which could explain the degradation of memory that many women experience during and just after pregnancy. 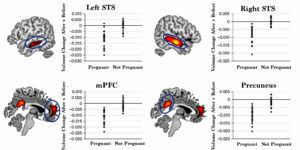 While memory wasn’t rigorously tested (they did a couple of tests but only found a trend towards memory loss) in this particular study, new mothers may take comfort from the observation that while the brain areas involved in social cognition remained two years after completion of the pregnancy, the volume of the left hippocampus had partially recovered (in 11 of the 25 mothers who had not fallen pregnant again). 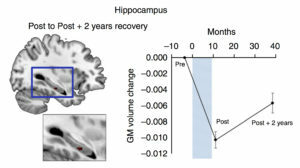 Assuming that the hippocampal volume continues to increase at the same rate, it would fall back into the normal range by around five years after the completion of pregnancy. Given the vital importance of the hippocampus for memory and navigation this seems to be a very promising result. This study used MRI to scan the brains of 50 women, of which 25 later fell pregnant for the first time. All were re-scanned after the babies were born, or after a similar period of time had elapsed for those who hadn’t fallen pregnant, so that brain structure could be compared before and after. Those women who did not fall pregnant served as the controls in which no significant structural changes were observed. Changes in brain tissue volume were only observed in those women who did fall pregnant confirming that pregnancy was the likely cause of the changes. They also performed an fMRI study looking for brain areas that were more strongly activated by pictures of each mother’s own baby compared to photos of other people’s babies. As there was considerable overlap between the brain areas more strongly activated by the mother’s own baby and those in which the brain volume reductions occurred, it seems likely that it reflects a process of specialisation for maternal attachment rather than collateral damage. As these areas are commonly associated with the capacity for Theory of Mind, i.e. the ability to see the world from another’s perspective, these changes presumably reflect a tailoring of the mother’s brain to help them better anticipate the needs of their child.